Current version of the plugin is 1.0.1, the first release + a small typo fix. Download it from the WordPress.org site. This WordPress plugin adds the possibility to easily insert forms created by Google docs into pages and posts using a shortcode. The form will be embedded using an iframe. It also contains options for default settings, so you don’t have to change all iframe codes if you e.g. change the width of your content column. First, create a Google spreadsheet form. This can be done by choosing Create new and Form in Google Docs. More information about Google Forms and how they work can be found on the Google Forms support page. 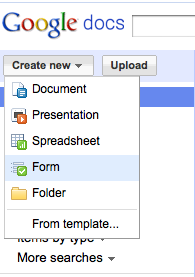 For those of you who like screenshots, check out Google Forms quick howto. What do I have to do to insert this form in my WordPress page? On the place in your post or page, insert a shortcode called googleform. This shortcode will be replaced by the Google form iframe. key is mandatory. The height, width and text parameters are optional, and defaults can be set on the plugin option page. After that: activate the plugin, and start inserting forms! Please leave a comment below when you encounter issues (or when everything works fine). Like posts like these? Follow my (English) RSS feed.